Honeydew is a member of the melon family of fruits also known as honeydew melon and has a pale green sweet and juicy flesh inside it. The sweet juicy flesh of a honeydew melon is one of summer supreme pleasures. Let’s see some of the amazing health benefits of honeydew here on this page. It is the member of the curbitaceae family and its green flesh resembles with the cucumbers and squash. In history, it is reveal that this fruit is originated in Persia. In Egypt, it has been grown from a long period of 2000 years. Later it started cultivation by Romans and later introduced to Europe during the rise of the Roman Empire. In 15th century it become popular in France region and later introduced in America. Honeydew melon makes a refreshing treat on a hot summer day and quite a popular fruit in all over the world now. Honeydew is rich in nutrients and vitamins like vitamin C, Vitamin B6, Potassium, Copper, and Fiber. It is very low in calories and it has been estimated that it has 60 calories per cup. Also is is composed of about 90% water, which makes is highly refreshing fruit for summer as it is also a good source of nutrients within it. A serving of honeydew also contains 1.4 grams of beneficial dietary fiber. Being a refreshing fruit and rich in fiber, it regulates digestion. Also, it has about 14 grams of natural sugar, and thereby it also, lowers cholesterol level and maintains weight loss. 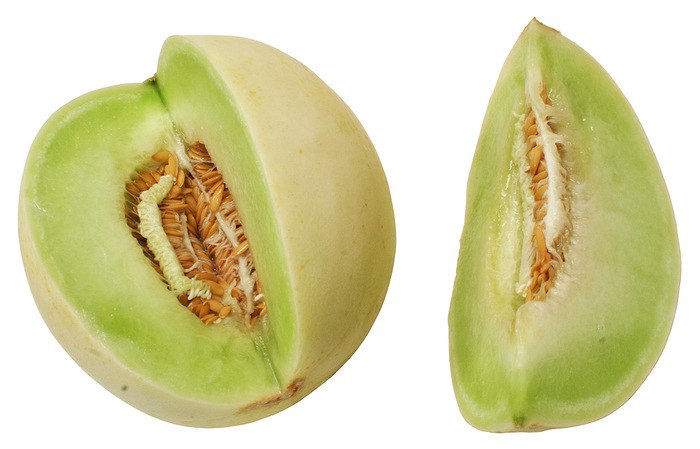 Honeydew Melon are rich in potassium and water, which keeps the body hydrated and effectively quenches thirst. It Promotes fairer and younger looking skin. It is rich in vitamin C content and copper mineral, so it promotes healthy skin by aiding collagen production and tissue repair and blood vessels. As it is also rich in calcium, it benefits to your bones strength and teeth. It is rich in potassium and also it has about 90% water content, the combination this make melon effective at maintaining healthy blood pressure levels. It curbs hypertension by preventing blood elevation. It contains lutein and zeaxanthin, which reduces the risk of cataracts and improves overall eye health. Being Rich in Vitamin C, it also boosts your immune system, prevents and fights against irregular bacterias that may builts up.